Derelict Grade II Listed Farmhouse and former farmyard with a series of redundant outbuildings. Site area of approximately 0.94 acre (0.38 hectare). Located within the Magor Conservation Area in the centre of Magor. Site suitable for redevelopment (subject to obtaining all necessary consents). Located within 1 mile of Junction 23A of the M4 Motorway. Large Church and Hall occupying a prominent and imposing position. Popular and established residential location close to Barry town centre. Potential for conversion or redevelopment of the site for residential and other uses (subject to grant of planning permission). Bilingual sales particulars are attached, and information packs for each site are available upon request via Dropbox. Offers are invited for the two sites as a whole. Offers may also be submitted for the individual sites, but preference will be given to parties seeking to purchase both sites simultaneously. 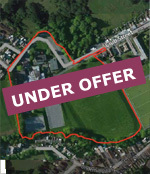 Outstanding development opportunity located within the heart of the sought after Vale of Glamorgan village of Bonvilston. The property currently comprises a derelict former residence set in grounds totalling approximately 2.5 acres (1.01 hectares). Comprehensive Development Brief available identifying the residential development potential of the site together with further supporting technical information. Detailed planning permission for construction of 6 detached houses and conversion of the former rectory into 2 affordable apartments. Allocated for residential development within Bridgend County Borough Council’s Local Development Plan with potential for 120-130 dwellings. Located within 1 mile of Bridgend town centre. For sale by informal tender by 12 noon on Friday 21 July 2017. Former car park and amenity land conveniently located adjacent to A467 Trunk Road and within walking distance of Newbridge Town Centre. Site area approximately 6.74 Acres (2.73 Hectares). Outline planning permissions for up to 100 units, subject to signed Section 106 Agreements. Substantial technical information available relating to the site. For sale by informal tender by 12 noon on Friday 23 June 2017. Situated on the south-eastern outskirts of Aberdare, the gross site area extends to approximately 8 acres. The land has the benefit of a resolution to grant outline planning permission for residential development under reference 10/0792, subject to conditions and completion of a Section 106 Agreement. In support of the outline planning application, a sketch scheme was submitted showing a total of 77 housing units. A copy of the indicative layouts, together with further planning and technical information is available upon request. An outstanding mixed-use opportunity to be developed predominantly for housing together with compatible commercial uses within 1.5 miles of Cardiff city centre. The site totals 17.3 acres (7 hectares), with the benefit of a resolution to grant outline planning permission for the demolition of all buildings and hardstandings and redevelopment for between 230 - 250 dwellings, associated public open space and landscaping and 5,800 sq m of mixed commercial uses, predominantly B1 uses, but including up to 400 sq m of Class A type uses (local shops, cafes etc), drainage works, roads, means of access, associated utiliities and infrastructure. The resolution to grant planning permission is subject to a Section 106 Agreement which is currently in draft format. Attractive three storey mid-terrace Grade II listed office building located within the Mount Stuart Square Conservation Area in the heart of Cardiff Bay arranged on three levels plus basement totalling approximately 4,900 square feet (455.35 square metres) currently operating as a gallery and offices with potential for alternative uses subject to obtaining the appropriate planning permission and Listed Building consent.